A blog relating to The Secrets of Radar Museum in London, Ontario. Today is International Women's Day, so in honour of the day, let's take a moment to recognise Dr. Elizabeth Laird, one of the first women working in physics and pioneer in Canadian Radar research. She was already retired from a 40-year academic career when she volunteered to assist in the University of Western Ontario's war-time Radar work in 1940. This began a further multi-year career with Western and long association with the department, finally ending with her death in 1969 at 94 years of age. 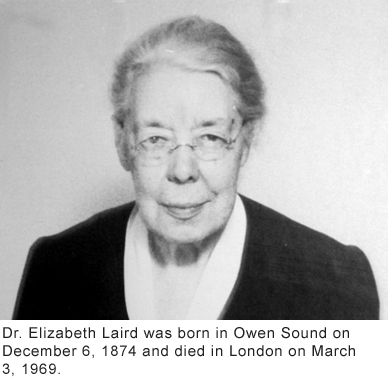 Elizabeth Laird was born in Owen Sound, Ontario, and spent much of her youth here in London. She graduated from the University of Toronto in 1896, but despite having been at the top of her class for three years, her graduate school scholarship applications were rejected solely because she was female. While undertaking PhD studies at Pennsylvania's Bryn Mawr College, Laird was awarded a fellowship to study under the famous physicist Max Planck at the University of Berlin in Germany. Although women were not formally admitted to the university at the time, Laird later recalled that, “there was no crowding in mathematics and physics, and I had no difficulty in getting permission form the different professors to attend their lectures." Laird received her PhD from Bryn Mawr in 1901 for her work on magnetism and spectroscopy, and was hired as an assistant in the Science Department at Mount Holyoke College. By 1904, she was promoted to Professor and made Head of the department. Over the next four decades, Laird undertook research at such distinguished schools as Cambridge, Yale, and the Universities of Chicago and Berlin. By the time Laird retired from Mount Holyoke and returned to London in 1940, the world was at war. Hoping to help the war effort, she walked into the Physics Department at the University of Western Ontario and asked if she could be of use. Laird's offer was gratefully accepted, and she was made part of a new team of researchers doing intensive research on radar development. Throughout the course of the war, she played a key role in studies on antennae radiation patterns and the radiation and detection of centimetre-wavelength waves. Laird presented several top secret reports on her findings to the National Research Council, taught army and navy personnel, and took her turn monitoring the unheated observation station on the university's campus – and refused pay for any of it. Laird was made an Honorary Professor at UWO in 1945. Post-war, she investigated the effects of microwave radiation on biological materials, work supported by the Ontario Cancer Treatment and Research Foundation. By the time she retired for the second time in 1953, she was not only one of Canada's most distinguished physicists, but also the oldest. Dr. Elizabeth Rebecca Laird died in 1969, at the age of 94.